As bikepacking goes more mainstream, Specialized has entered this once hand-tailored domain with their new Specialized Burra Burra bikepacking bag line. Like Ortlieb’s new gear, the Burra Burra bikepacking bags are waterproof, seam-sealed and employ weather-resistant zips. Unlike many brands (with the exception of Porcelain Rocket) the Specialized saddlebag comes with a unique stabilising bracket that mounts to the seatpost, and a handlebar bracket which holds the handlebar harness firmly in place. The name ‘Burra Burra’ is derived from a trail located in Henry Coe State Park in California USA. Although origin of the trail name is a mystery, what we do know is that this is a steep offroad trail – the kind of place you don’t take panniers. These bags will be available late-August. Let’s take a closer look at Specialized’s new bikepacking bags! The waterproof saddle bag will come in two different sizes (8 or 10.5L) depending on your needs. Both bags employ the seatpost mount (27.2 or 30.9mm) – essentially just a clamp with two protruding arms to stop the bag rocking back and forth. The rolltop closure allows you to modify the bag’s size based on the gear you’re carrying. They come in at US $130 for the 8 litre and US $140 for the 10.5 litre. 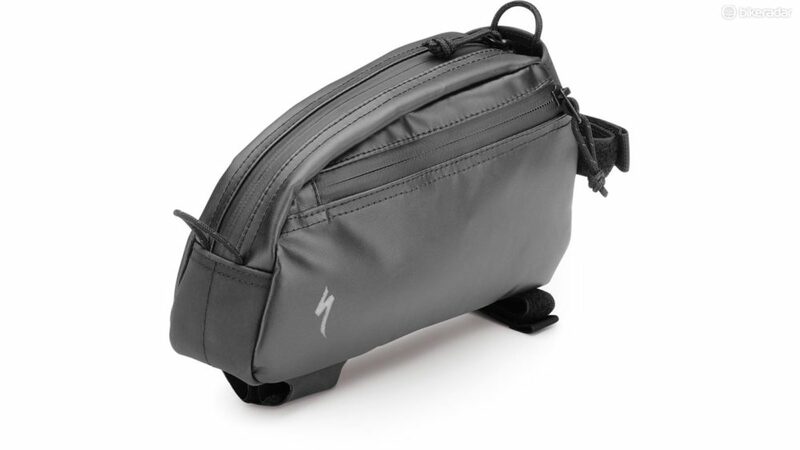 The Specialized Burra Burra Saddlebag offers minirack stabilisation. The handlebar harness comes with a handlebar mount to keep your front load in check. Designed to fit both flat and road handlebars with a 31.8mm diameter, the harness will space your luggage away from your handlebar, perfectly accomodating the 13 and 23 litre drybags. These specifically-designed drybags feature roll-top enclosures on both ends, and have a zip on the top for quick access to small items. The harness retails at US $90 and the 13L and 23L drybags at US $40 and $45 respectively. The Specialized Burra Burra Handlebar Harness has a built-in mount to keep it stable. 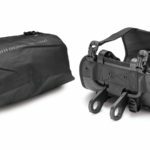 Specialized have introduced size-specific partial bikepacking framebags for their bikes so that you can carry a few things while still fitting in a bidon or two. The 3, 5 and 8 litre bags will retail for US $90, $100 and $110 respectively. The Specialized Burra Burra framebag comes in three different sizes depending on your frame. 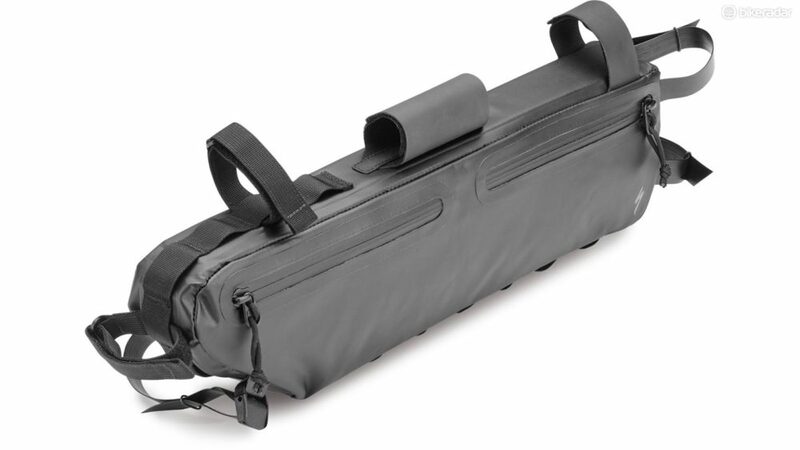 The Burra Burra top tube bag is not particularly special, but will match the styling of the other bags in this range. Its 0.75 litre capacity is good or carrying snacks, money, a phone or a small camera. You can get this for US $50. The Specialized Burra Burra Top Tube Bag will give you handy access to snacks, money or a camera. 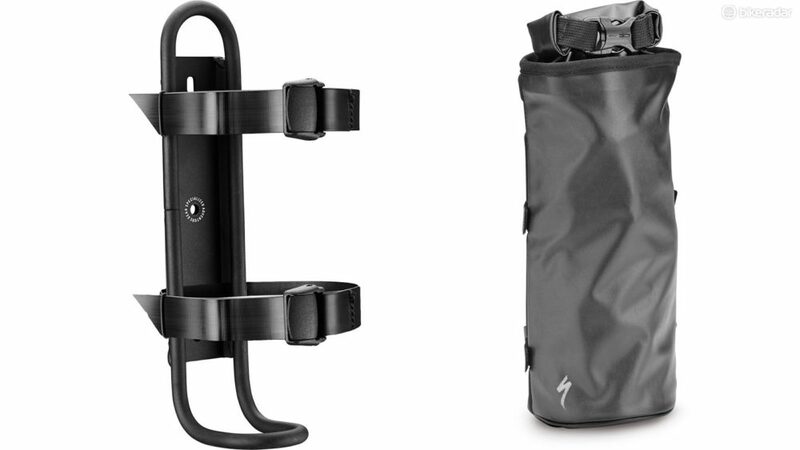 The Cagerack is like many of the other fork mount cargo cages with its double strap design. Specialized designed a 1 litre Cagepack to slot in nicely (US $40), but you’ll be able to fasten all kinds of cylindrical objects in the Cagerack (US $30). The Specialized Burra Burra Cagerack will mount to the side of your fork and adjust to fit cylindrical objects. This padded 10 litre bag sits on Specialized’s own Pizza Rack. The roll-top design allows you to easily stow lots of gear right while you’re still straddling your bike. On this bag you’ll find zippered side compartments for keys, money or SD cards. The Pizza bag is sold in conjunction with the Pizza front rack for US $100. The Specialized Burra Burra Pizza Bag is a good alternative to the handlebar harness if you use a front rack. Head HERE For A Complete List of Bikepacking Bag Manufacturers!